9 years ago, the summer after I turned 8, I went to spend the night at my friend Heidi's house. 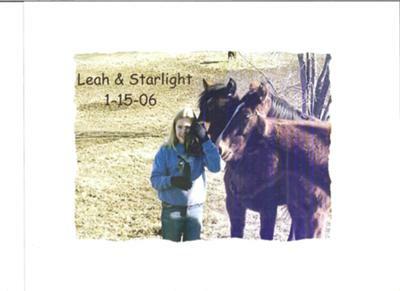 I had loved horses since I was 2, and she knew that, but she had never mentioned the fact that she lived down the road from a neighbor's house who happened to have almost 25 horses. Her older sister SJ was mowing their yard for the summer, and she invited Heidi and I to come along. Heidi spun around with a grin on her face, "I totally forgot! They have TONS of horses! We can play with them while SJ is mowing!" I squealed. 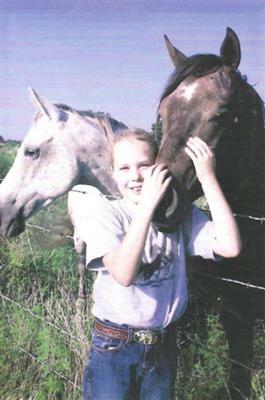 Being only 8 and living in town, visiting a horse was pretty rare. But lots of them? Today would be a great day, and it would change the rest of my life. We walked up the gravel road, reached the top of the hill and turned right into a long driveway. To my left was a field of corn, to my right was a barbwire fence running parallel with the driveway. I saw horses of all different colors scattered throughout the field close to the house. We walked down the fence line to the house and yard, where part of the fence was old white boards instead of barbwire. We whistled until the horses decided to check us out and see if we might have any goodies in our pockets. A beautiful chestnut Arabian mare was one of the first horses to come up to us, followed by a rainbow of horse colors. There were so many of them, and to say that I was excited would have been an understatement. I leaned down to pick another handful of the long green grass when I felt something on my back. It was gentle, playing with my hair and breathing on me. I slowly stood up, and leaning it's head over the fence was a brown horse, staring at me. I smiled at this new friend, I hadn't seen him until now. The other horses seemed to lose interest in me and went to find Heidi, while this brown horse stood still. He, I later found out, was an Arabian/Quarter Horse stallion, with possible other breeds in his blood. He had a white spot on his forehead, which faded out into the rest of his hair, because he had little white hairs all over his face and body, but wasn't a roan. He also had a crooked triangle on his left hind foot, with the part of his hoof right under the triangle being peachy pink. He wasn't the flashiest horse in the herd, nor was he the tallest. With his odd coloring, he was something a lot of people would call the "ugly duckling" of the group. But there was a spark in his eye, a spring in his step, and a gentleness in his heart that captured me instantly. I couldn't take my eyes off him. Literally. To me, he was the most beautiful creature I had ever seen. I finally turned my gaze to Heidi, who was being slobbered to death by more horses. I laughed and, motioning to the brown stallion, asked, "Does this one have a name?" "No, most of them don't. There's only a few that do have names." I looked at my new friend, and wondered what his name should be. Not being very experienced in naming horses, I let it rest until I could think of a good name. I felt something tickle my hip, I looked down to see the brown stallion pulling a small carrot out of my pocket. "Hey! That tickles! Stop!" I managed to giggle out. He was the sweetest horse I had ever known, but also the first horse I ever built a relationship with. For the rest of the time we were there, I spent it learning every little thing about him. Where he liked to be brushed the most, what treats he preferred, and where he loved to be scratched. Before I knew it, it was time to leave. I didn't know how to say good-bye, so I just walked up to him, whispered in his ear that it was time for me to leave, but I would be back as soon as I could. He lowered his head some, and I kissed the spot on his forehead, and walked back to Heidi's house. I read a fictional horse book about a herd of mustangs, and in the book was a stallion named Raphael. Even though the horse in the book was dark bay in color, their personalities were extremely similar. Raphael would be the brown stallion's name. On Heidi and I's next visit, the brown stallion was waiting for me by the fence with his ears forward. I ran and hugged him, "I found a name for you! I'm going to name you Raphael!" I then began telling him about the book I had read and because the fictional horse reminded me so much of him, that's why I chose that name. I smiled and hugged him again, then we walked along the fence line towards Heidi, who was petting and feeding a white mare. Heidi and I began talking, and out of the corner of my eye, I saw Raphael toss his head up, and a few others did the same, then without warning, they all took off at a full gallop. They ran around a group of short trees, down a hill, and we could see them run with their beautiful long strides, a sea of chestnut, brown, white and black, with Raphael in front. It was the most breathtaking view. They veered to the right and began to gallop back up the hill, then slowed down to trots and canters back to me and Heidi. Raphael came back slightly prancing to where I was standing with his ears perked up, as if to say, "Did you see what I did? Did you see me? Huh? Did ya?" I shook my head and laughed. I just couldn't believe how funny he was. As with all of our visits, time flew by and it was time to leave sooner than I wanted. I wanted so badly to stay, and it made it even worse when Raphael pushed his head against the front of my body and let me hold his head. It made me want to cry. With every visit we were getting closer, our bond getting stronger, and it was getting harder and harder to leave. I kissed the spot on his forehead again and as I waved goodbye, he tossed his head and didn't take his eyes off of me until we could no longer see each other. He was my first best friend. Best Friends (Our True Story) - Chapter 3: Same Age... And Name? Chapter 3 - Same Age... And Name? As time went on, there were times when Heidi didn't come with me to see the horses. One of these times when I went by myself, my parents drove me, and I introduced them to all my new four-legged friends. I was brushing Raphael when his owner, Jim, drove up and pulled into the driveway. He and my parents already knew each other somewhat, so they started talking as I quietly listened while still brushing Raphael. My mom was closest to me, so I gently pulled her aside and asked her if they could ask how old Raphael was. They did, and Jim looked at Raphael and seemed to be lost in his own thoughts for a moment, then said, "Oh, I think he's about eight." Raphael? Eight years old? Just like me! I grinned at Raphael and kissed his nose. This was so cool! I turned around to watch my parents talk to Jim, and that's when my heart sank. My dad had just mentioned the fact about how I would love to have Raphael, when Jim shook his head and said, "No, she don't want that horse, that's for sure. He's wild, and he bites." Just as the last words slipped off of his lips, Raphael got as close to the fence as he could, and dropped his head just over my shoulder as I wrapped my hands around his nose, and my mom took a picture. It was Jim's turn to have his mouth drop, and I tried my best not to smile. I knew Raphael as well as I knew myself, if not better, and I knew what he said wasn't true. After that, Jim really didn't say much, and I don't remember a lot after that either. Soon after that, we had to make a trip to the city. During our trip, we stopped to eat at Olive Garden, and being both under twelve, my brother, Deavon, and I got the kids' coloring menu. On the menu was a wordsearch for famous Italian artists, and I soon found Raphael, but the name was backwards in capital letters - LEAHPAR. I gasped. My name was in his name! I grabbed the paper and showed it to my parents, who both thought it was really neat, then my mom looked at my dad and said in a soft tone of voice, "We really need to try and buy him for her." I started having dreams. Some sad, some happy, but they all had Raphael in them. No matter what they were, I always told Raphael about them. Of course being young and full of imagination, sometimes I wondered if he had the same dreams, or at least dreams with me in them. But there wasn't a way I could find out, so I told him all of mine. Whether it was galloping across a beautiful field with tall green grass, jumping over home-made obstacles in a dusty pen, or, in very sad dreams, finding out he was sold, I told him everything. He was my closest friend, and at that time, one of my only friends. I was different from everyone, I always had been. If I ever had any friends, they only wanted me when it was convenient for them, or as a way to get to something, or someone, through me. But Raphael did none of those things. He was always there, whenever I needed his shoulder to cry on, his warm neck to wrap my arms around, and his soft nose to kiss. He was always welcoming, always wanting me with him, no matter what we were doing. His only condition in our friendship was in the order we did things: Treats first, grooming and hugs second, and then we'd talk. And depending on the day, we would play games together. Our favorite, and the one we played most, was tag. I will always remember the first time we played, Raphael had just finished munching an apple when he looked at me, then took off to his left, trotting down the fence. I stood in the same spot on the other side of the fence, confused. After about 4 fence posts, he slowed down and turned his head slightly to the right and looked at me out of the corner of his eye, I saw the playful look, and I smiled. I took off running after him, and just as I reached the spot where he had slowed down, he spun around and trotted back the other way. "Hey!" I giggled as I changed directions. He seemed to smile, as if he enjoyed making me run back and forth. I caught up with him, and he slowed down to a walk, then stopped and searched the dark pink and gray backpack I had always brought with me for treats, as if he deserved one for winning the game. I couldn't help but laugh. "Very funny, you ate them all!" He did not like to share. From just a handful of grass, to spending time with me and being brushed, he wanted it all, and he would get upset when I gave another horse a bite of one of his apples, or brushed another horse with his brush that I bought. At the time, his mane and tail was not a solid brown color, it had brown, white, gray, and black mixed in, and I found a brush at my local store that matched his hair exactly, so that's why it was "his." But even through he disliked sharing, he was never mean about it. Instead, he would almost pout about it. And every time he did, I would repeat over and over how much I still loved him even though I gave the other horses attention. Even if he couldn't understand the exact words, my talking seemed to let him understand the point, and he eventually learned to be patient while I would give an extra treat to another horse, and sometimes he would find an extra apple or carrot waiting for him after, which he absolutely loved. He was also very protective of me, but not possessive. He literally kept me safe in all possibly dangerous situations, even putting himself in harm's way a few times to make sure I didn't get hurt. On one of these occasions, a young colt, born on July 4th (I nicknamed him Firecracker) and no older than 2, had a feisty attitude most of the time, and would bite if he didn't get his way. Firecracker was being greedy for some of the baby carrots I had been feeding Raphael one Winter day, and I wouldn't give him any because I had already given some to the other horses when he wasn't around, and Raphael got the rest. Firecracker pinned his ears against his head, and in what seemed like slow-motion, I saw him bare his teeth, open his mouth and lunge at my shoulder. It happened so fast, I had no time to react. But just in time, I saw Raphael bare his teeth right back, charging right toward Firecracker's throat latch. Firecracker never reached my arm, and Raphael closed his teeth on Firecracker's neck, and I saw a flash of pain cross Firecracker's face, and Raphael soon let go, but then he chased him off down the slight slope in the direction of the pond. Raphael didn't chase him very far, just enough for Firecracker not to want to return anytime soon. Everything happened so quickly, but I remember every detail, and how slow time seemed to pass. Raphael walked back to the fence line where I was standing, with me in awe at the fact that he just saved me from getting a possible serious injury, but also endangering himself to do it. I hugged him, kissed his nose and checked him over for injuries, just in case. I thanked him again and again, thinking about how much he meant to me, and what a special horse he was. That wasn't the only time something like that happened through the years, I will probably only mention a few more times he protected me, but it is the one that has stood out to me the most. To say the least, attempting to train a horse when you're on one side of the fence and he's on the other, is very difficult. I had no problem leading Raphael everywhere, because he followed me around like a puppy. But what I really wanted to train him to do, was come to me on command. I saw Lord Of The Rings, where Gandalf's white horse, Shadowfax, came to him when he whistled, and I'd read stories of people who had trained their horses to do the same. "Why not? I'm not sure how to train him to do that, but it's worth a shot." Raphael had already learned the sound of our Dodge mini-van, and would come to the fence as soon as we reached the driveway, but there were still some days he wouldn't come as quickly. So on those slow-poke days, I would run to the fence, whistle as loud as I could, and make it last a good 3 or 4 seconds. I wasn't sure if he was actually learning it, or if he just started walking up because he saw me. We ended up buying a new van (a few years later actually), and he didn't recognize the sound of that one, so he stayed with the herd. On one visit after we bought the van, he was behind a few of the other horses, and didn't see me at the fence, so I decided to see if he really soaked up any of that whistle training. I set my backpack down and let out a long whistle, and saw him toss his head up and look towards me. I heard a soft nicker as he came trotting up the slight hill, and I was grinning from ear to ear. By the time he got to the fence, I could hardly contain myself. I wanted to jump up and down and squeal. I hugged him and said, "You did it! You came to my whistle!" But he was already trying to search my backpack for his apple. On a visit on a Spring day, I brought an entire bag of carrots for the horses, but of course, Raphael got the first few. As Raphael was approaching the fence, I was having a hard time opening the plastic bag that held the carrots. Raphael was now standing in front of me, and he reached his head over and grabbed one end of the bag, while I held the other. I pulled the bottom half of the bag while he held the top half in his teeth. Together we opened it, and I let go of the bag... for just a second too long. Raphael threw his head up, and tossed the bag over his back behind him. I saw the open bag of carrots fly through the air and drop in the dirt, roughly 10 or so feet behind Raphael. "Hey! You weren't supposed to do that!" When people say that animals don't show emotion, nothing could be further from the truth. I swear Raphael was smiling. I stood there with my mouth gaping open, then shook my head and smiled. I had to ask my dad to retrieve the bag of carrots, he didn't feel safe with me going in to get them. Many horses were gathered around the bag on the ground, pulling out carrots, one by one. My dad picked up the bag, and started handing out carrots on his way back. By the time my dad got out of the pasture with the bag, it was empty. I couldn't help but laugh, and as I looked at Raphael, I knew that if he could, he probably would have been laughing, too. Raphael's first signs of turning dapple gray! I was getting closer to becoming an official teenager, and changes were on the way. When all my friends were starting to go boy-crazy, I stayed horse-crazy. I had survived the rough transition where most kids, any that were into horses, decided to move on to other things and drop out of the "horsey-phase". I thought they were weird when they would talk about the latest and greatest guy, and they thought I was weird when I would talk about Raphael. I had a picture of Raphael on a cell phone, and took it to youth group one day. I had the picture up on the screen when a boy came up to me and asked, "Who's horse is that?" I looked up at him, not wanting to tell him that Raphael wasn't mine, I waited for him to say something else. "That is the ugliest horse I've ever seen!" I shot him a glare as he walked off. That was my best friend he was talking about, and I was not happy about it. Eventually, I took an interest in a boy from church, and 2 months before I turned 13, he became my first "boyfriend". It lasted 15 days. I was devastated. My mom reminded me that the first crush is always the hardest, so I tried to keep that fact in my head. The next time I saw Raphael, I told him how upset I had been, and I told him I was sorry, though not exactly sure why, I knew I didn't want him to feel like he was of less importance than a boy. I was over at a friend's house on a hot day in Summer, when we came inside to get some drinks and cool off indoors. I walked into her room and noticed a picture of a chestnut mare on her wall that she had printed out. Motioning to the picture, I asked, "So, do you want a specific chestnut mare, or just any that come along?" "No, I'm not setting my heart on a specific horse, because then I'll get depressed like someone else when that horse isn't for sale." I lowered my eyes to the floor, feeling like I had just been turned into a tiny ant - and was about to get stepped on. Ouch, I guess that means me. I tried not to let it upset me whenever someone said something against Raphael, or how much I loved him, but it was hard - with the fact that I can have a temper, especially when someone says words that knock Raphael down. It wasn't just me that was changing, Raphael was changing, too. He had already been a full-grown adult horse when we first met, but as he reached his teen years, his coat started changing. 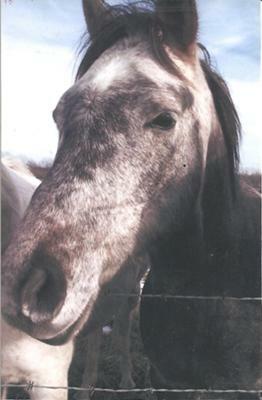 Gone was his brown body, along with his mane and tail of mixed colors. In their place was darker colors, nearly black all over his body, and his mane and tail still had mixed colors, but only had a few strands of brown left in it, with the rest being gray, black, and white. I almost didn't recognize him when I first saw how he had changed. I had to get used to his new color, but then discovered that he wasn't done changing his colors just yet. Now before I go on, I do have to mention that for almost as long as I have loved horses, I always admired dapple grays. I never really had a reason why, but maybe it was because I had never seen one in person, and I never had seen a lot of pictures of them. In my world, they were almost "rare". And of course, I loved their dapples over their gray coats. The next thing I noticed was Raphael's face. He still had the white star on his forehead, but he was starting to have more white hairs all over his almost-black face, along with a handful of reddish-brown speckles. Round spots on his coat started fading into gray, then almost white. He was becoming dapple gray! P.S. QUESTION TIME: Do you guys want a hint about whether the end of the story is happy or sad? Tell me in the comments below! :) Thanks for reading, I now present Chapter 9 - My First Horse! On January 15th, 2006, my life-long dream had come true. I had been taking riding lessons from Joyce Fox in Brunswick, Missouri, and my parents told me we would be buying a horse from her - for me. I was excited, but something inside my heart started to crumble, like the first few stones falling before a rockslide. I had my heart set on Raphael, not a horse I would meet for the first time today when I bought it, not a horse who I had no idea what it's personality was like. I felt guilty for not being as excited as I should have been - or would have been if we were driving to purchase Raphael... but no. I don't even know this horse. I know Raphael... I'd rather have him. My thoughts were interrupted as we pulled into Joyce's driveway, her dogs barking at our tires. Walking through the barn to the pasture with the yearlings, I felt my enthusiasm rise. I started paying more attention to what was going on around me, instead of thinking about the negative facts... for instance, that it wasn't Raphael I was buying. There was a small group of yearlings gathered around a hay ring, munching with content, all of them either chestnut or bay in color. Some looked at us with brown, curious eyes, others left their heads buried in the hay. I took time looking each one over, looking for one with unique facial markings. I found a bay colt with a blaze that started out wide on his forehead, thinner on the bridge of his nose, and widened back out close to his nostrils. I smiled at him, extending my arm to scratch his nose, in which he reacted with distantly sniffing my hand, then abruptly turned to finish his meal. I looked around, and seeing a chestnut yearling close by, I reached my hand out to it's nose. This little yearling apparently didn't want any company, and took off at a brisk walk around the other side of the hay ring. Man, if I get any one of these yearlings, I want it to be one that wants to spend time with me, not run away and hide. I followed the chestnut yearling that had taken the turn around the bale, and found a bay filly happily munching hay while looking at me intently with her ears tilted towards me. She had a soft, kind expression on her face, along with a white shape on her forehead that resembled a thick sliver of a moon, and a white snip on the end of her nose. As I slowly walked closer to her, she stood still, continuing to look at me with her sweet face, ears perked up, as if to say, "Hi there, what's your name?" I brought my hand to her face, and as she seemed to enjoy the attention, I couldn't help but smile. I kept petting her for a few moments, then we moved onto the next pasture with the mares and geldings. There were a few buckskin mares that I inquired about, but by the tone of voice that Joyce was using, they were not for sale, or if they were, the mares were extremely out of our price range. I also met a sorrel gelding named Jack, who had 4 white stockings and a wide blaze running down his broad nose. We retraced our steps back to the yearling pasture, and I made my way to the little bay filly. I kept smiling as I spent more time with her, thinking about her sweet personality that was so evident in her pretty face, and the way she treated me. I heard a voice coming from behind, it seemed to be directed at me. I turned to see my mom, dad, Joyce and her husband Larry, all looking at me. "Have you picked one out?" I turned back to the yearlings, scanning the group for the one that would become my very first horse. The bay colt with the unique blaze, the chestnut who didn't want company, then the bay filly standing next to me. Those were my three choices I had already made a mental note of, but now I had to pick which one. I looked to my right at the bay filly and patted her on the neck as a smile spread across my face. We walked through the barn and back to the house, and Joyce went to search for the papers for us to sign. She came back into the kitchen, setting a thick binder on the counter, and flipped to the filly's paper. Tapping her finger on the plastic sleeve that protected the records, she stated, "This is her's." I looked down at the paper, my eyes automatically searching for the filly's name. Bonita's Oak? I don't think I like that. "That's her name?" I looked at Joyce, who must have seen my expression of displeasure, because she smiled. "That's her registered name, but you can call her anything you want." And that's what I did. I named my little bay filly "Starlight". Oh, and to everyone who has said I should publish this, I'm going to try! It costs a lot to publish a book though, and I really wanted just one copy for myself, but it turns out you can't do that, you have to order at least 100 books. So I'm not sure what's going to happen yet. The van barely came to a stop before I half jumped, half tumbled out of the passenger door and started running down Jim's driveway. I went to visit Raphael, and to my heartbreaking terror, I found him being loaded into a stranger's trailer who didn't even know him, let alone love him, like I did. Running to the trailer, I felt like my legs straining to increase my speed, though it felt like my speed was that of a sloth. I reached the trailer just as a man slammed the metal door closed, causing Raphael to shriek in fear. "No! You can't take him!" I cried, tears starting to run down my face. I was able to grab the trailer door before the truck pulled away, but the latch on the door seemed to be stuck in place - no matter how hard I pulled on it. The same man who had closed the trailer door came up behind me and lifted me off the back of the trailer with ease, as if I was just a piece of dead bark off an old tree. My hands slipped off the metal, even though I felt like I was using every muscle in my body to hold on. I felt my feet gently touch the ground, and the man's grip around me disappeared, along with the trailer, hauling my precious friend farther down the road and out of sight. All of my strength seemed to vanish, and the only thing I could do was cry. I looked at Jim, my face red with anger but soaked from free-falling tears, and trying not to scream, I raised my voice at him, "Why did you do that?! You knew I loved him! You sold him! You knew I wanted him! You knew!" As if by some unseen power, my torso launched into an upright position in my bed, nearly scaring me out of my wits. I was breathing heavy, and I felt water on my face. I brought a shaky hand to my cheek, and realized I had been crying in my sleep. I let out an enormous sigh of relief, and let myself drop back into my bed and under the covers. But I couldn't sleep. Not after a dream like that, anyway. I stayed awake for a long time, thinking about how thankful I was that it was just a dream, and praying for it to never become a reality. "God, please don't let that ever happen. I don't know what I'd do without him... He's my best friend."